INMOTION Technologies, Co., Ltd. Is announcing the upcoming INMOTION World Carnival 2016’s Fancy Self-Balanced Vehicle competition. INMOTION Technologies, Co., Ltd. Is announcing the upcoming INMOTION World Carnival 2016’s Fancy Self-Balanced Vehicle competition where different individuals with unique talent on using the self-balanced vehicle can showcase their creativity in riding any INMOTION Unicycle models. 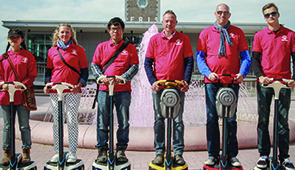 The competition will be one of the ways on letting the public know other ways of using the self-balance vehicle aside from its original or basic purpose. Since the electric unicycle has been widely used in different places across the world, there are already countless individuals who own a single unit and are using it in a daily basis. However, no matter how popular the vehicle is, there are only few who can make use of it in a more interesting and fun way. There are even no large scale competition that attracts people to find out other ways of using it. This is what INMOTION wants to provide: a competition where riders can compete for the best rider who can show self-transcending and creativity. It is given that the balance vehicle festival is attracting a lot of attendees who are interested with checking new INMOTION SCV and INMOTION Scooter models and other possible offers. This year, the fancy self-balanced vehicle competition is expected to set a new attraction in the carnival. A competition that will get the interest of more people who are interested with playing with their self-balanced vehicle and competing for being the most creative rider of the vehicle. Though there are already other brands of self-balanced vehicles, the competition will be more focused on how riders can show their creativity using the different INMOTION self-balanced vehicles or INMOTION Sensor Controlled Vehicles exclusively from the V series. The announcement is one way of letting people know about the competition and prepare for it if they are interested joining the event. INMOTION Technologies, Co., Ltd. is a company that delivers the most innovative and stylish sensor controlled vehicles not only in China but also in different countries. They are holding their INMOTION World Carnival this year and expect more people to attend the event. Company Name: INMOTION Technologies, Co., Ltd.